For help identifying the fiber, go to Determining Fiber. 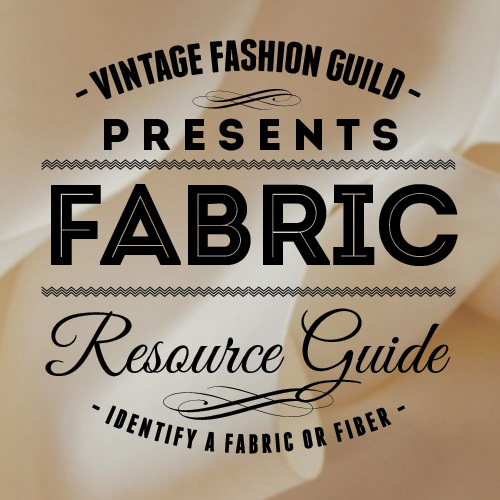 If you have clearly determined the fiber of a fabric, look for your fabric among these groupings. Keep in mind that these are fiber families. For instance, in the wool category you will find fabrics that resemble or are related to wool fabrics, such as an acrylic ribbed knit. If a fabric is a blend of two fiber families, it is most likely to be in the category of the more prominent fiber. There are a number of natural fibers not represented in these lists simply because there are relatively few specific fabrics made of these fibers (such as hemp and ramie). There are no manufactured fibers that have their own heading because all the manufactured fibers are manufactured to resemble natural fibers. For instance, a rayon fabric made to resemble linen (butcher cloth) will be found under Linen or linen-like, but a rayon made to resemble silk, such as a rayon velvet, will be in the Silk or silk-like category.